Extended TextArea Widget - more functionality: where I used a widget from Jim Leichliter to be able to reset the Short Answer question. Widgets were meant for SWF-output only, including the widget by Jim (this one, he has some widgets that are also compatible with HTML5). Since Captivate 7 the TextArea widget got a companion, the 'Scrolling Text Interaction'. Don't be confused by the name, it is essentially the same widget, but compatible with HMTL5 output. In this post I will explain the conditional advanced action, and also point to another well-hidden gem, only in Captivate 8: the Captivate team has now embedded the variable control in the Scrolling Text Interaction! Don't tell that they are not listening to users :) What was only possible with the extended TextArea widget by Jim in previous versions, can be done with the supplied Scrolling Text Interaction. The description of the problem: " We are basically validating the content in the widget and showing appropriate feedback. Since the user can enter anything in the widget, we are only tracking the keywords. To be precise, we are trying to create an Advanced Action like this, where the text entry should contain the words Organizational, Behavioral, and Managerial but not the words Transformation and Non-Compliance. If the entry contains any of the "illegal" words, then incorrect feedback caption should appear." If those conditions are not all fulfilled, the Negative feedback should be made visible. Because of the missing operator 'does not contain' this cannot be done with one decision, one IF combination using AND, which explains why the user was stuck. Show the appropriate feedback based on the value of that Boolean. This has led to a conditional advanced action with three decisions. Watch this movie, created with Captivate 8, customized theme 'Flat', using custom shape buttons (one is a freeform shape) with three states and the new Scrolling Text Interaction. 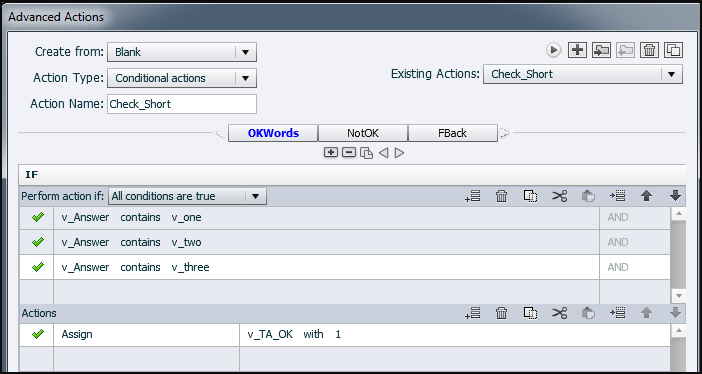 v_TA_OK: the Boolean variable explained above; default value = 0, will only be set to 1 if all conditions result in correct. v_null: an empty variable that is needed to create conditions for the other advanced actions (as the ones that check if all word fields have been filled); I will not explain those actions here; more info: Where is Null? 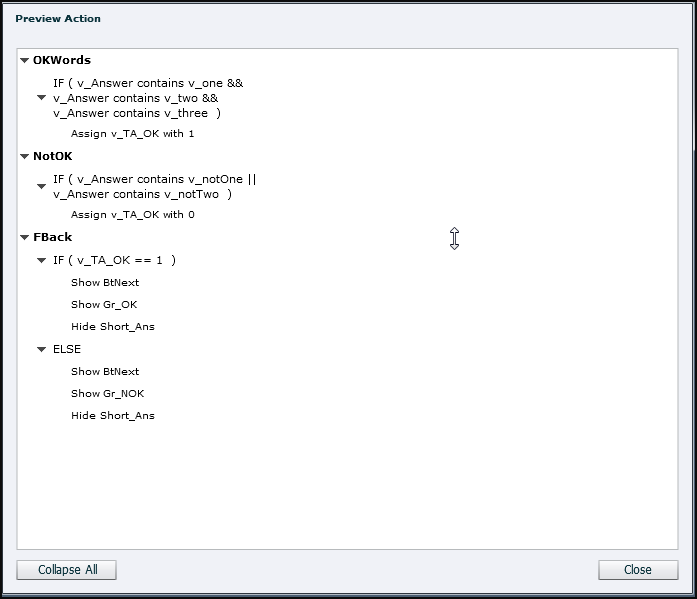 This decision checks if all the imposed words are present in the Short Answer, using the operator 'contains', with AND combination. If that is the case, the Boolean v_TA_OK will be set to 1. You see that the Interaction (indication is Widget on timeline) is not on top. The Next button is not on this slide, but on the first slide and timed for the rest of the project. That shape button is hidden/shown when necessary. Variables are case sensitive, and contrary to validation of a Text Entry Box it is not possible to get rid of that case sensitivity for variables associated with this interaction. If necessary you'll have to create more decisions. 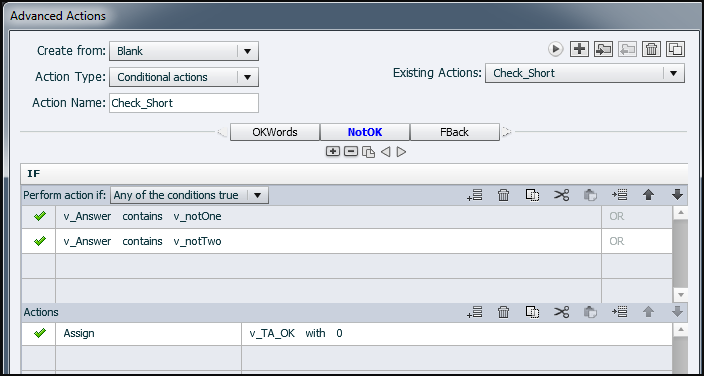 If the first decision is negative, variable v_TA_OK will remain at 0, no need to include an ELSE part. This means that the variable can never be set to 1 anymore, but the second decision will nevertheless be checked by CP. If both negative words are not included, nothing happens with the second decision, v_TA_OK will keep its value 1 or 0 depending on the result of the first decision, because there is no ELSE part. The new possibility in Captivate 8 to change the value of the variable associated with the Scrolling Text Interaction and have this displayed in the interaction is important if you remain on the same slide. Contrary to the extended version of Jim's TextArea widget, the rule that variables for each interaction are cleared when you leave the slide is also applying to the Scrolling Text. If you want to keep value of the variable you have to transfer it to another variable. Thanks, Lieve ! Encore une belle démonstration ! Most of the learning interactions have problems with HTML5 output, and this one is not an exception. You cannot reset it neither, which means that controlling the display by changing the value using an advanced action has no effect. Sorry, I knew about it, should have mentioned. My personal opinion is here that this is way to complicated for advanced actions. I would recommend to use JS for anything that is randomized, or needs arrays which is the case here. You can retrieve the value of the variable associated with the text area interaction in JS and use it there to return a question.